Today ( February 2 2019 Australian time) marks the first anniversary of the passing of our Forum founder Des Delatorre. In Des’ honour we have chosen today to officially launch the Des Delatorre International Memorial Group Build competition in what we hope will become an annual event to pay tribute to Des and honour his legacy. Registered members of the Forum are invited to make a WW1 model in Des’ memory and post progress updates on the special Group Build board that will be created. A full list of rules is published below. The GB starts today. Registrations via a PM to David Wilson close on March 2 and the group build will end on August 2 this year, giving participants a six months’ build timeframe. 1. Open to all registered members of the forum as at February 1 2019. Members from all skill levels are encouraged to enter. 2. Your entry may be an aircraft, artillery, armour, vehicle, figure or ship or a diorama containing one or more of the aforementioned. 3. The model must represent a WW1 subject operational during the period 1914-1918. 4. A build log should be started as a new topic on the special GB page that has been created. Initial photos should include proof the model has not already been started. Progress update photos should be added to your build log. 7. You can enter as many times as you like. Entrants must register via a PM to David Wilson who will compile and post a list of all entrants. 8. Start date is today February 2 2019 and the GB will run for six months. Entry registrations will be accepted up until Midnight (Australian Eastern Standard Time) on 2 March 2019. After that point no further GB registrations will be accepted. 9. End date for the GB will be midnight on 2 August 2019 (all times and dates are Australian Eastern Standard time). 10. Judging will be conducted by a panel of international judges. The judges’ decision will be final and no correspondence will be entered into. Albatros Productions Wingnut Special publication from Ray Rimell and/or a rare kit of his choice. A Propeller and set of hubs from the British collection courtesy of Alex Belov of Proper Plane. Two sets of decals from existing stock or pre-orders, excluding Limited Editions courtesy of Pheon Decals. A special prize of a 1/32 scale kit from Des Delatorre’s own stash. Special thanks to Chris Johnson for his excellent graphic incorporating a photo of Des and an image from the Australian War Memorial collection. Adrienne Delatorre has asked us to post a message on her behalf on the anniversary of her husband Des' passing, and to send best wishes to all group build entrants. I would like to thank firstly David Wilson for his outstanding running of the Forum as new owner, secondly all the members past, present and new for their support both of me and David. 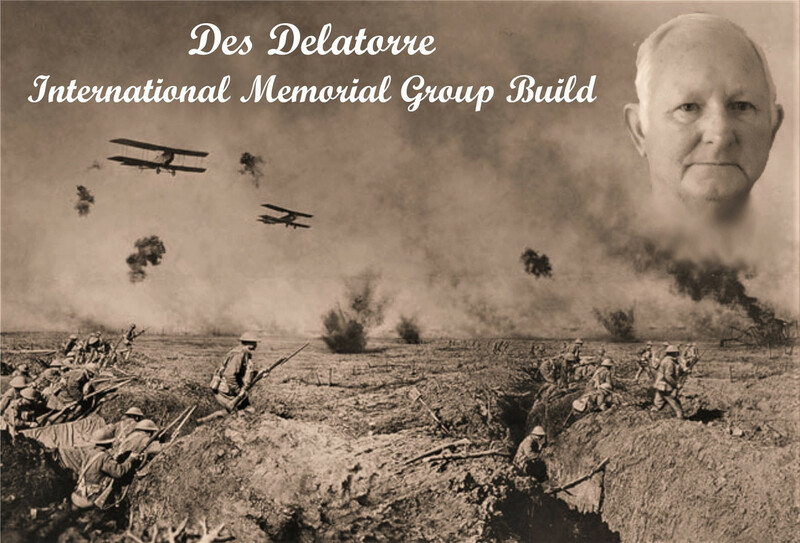 I would like to wish everyone well for this, the inaugural “Des Delatorre Memorial Group Build”. Also, a big thanks to all the donors of prizes, and for their support of the Forum. On a personal note, I know Des would be as pleased as punch this is for him. He thought the world of his Forum and all the friends he made over the years. He will be sadly missed in the future . Des brought a lot of us together on this forum; this group build is a great and fitting tribute on the anniversary of his passing. I agree 100% with Bo!!! Glad to partecipate, this GB is a great way to honour Des' memory. A big thank you to those members who have registered for the group build so far. As of today ( Feb 6) we have 27 registered entrants which is really encouraging given the GB was only launched a few days ago. Registrations via a PM to me, close at midnight on March 2 ( Australian time) after which I will post a list naming all of the entrants. Note - you don't have to decide yet what your GB model will be. Just register then decide later, mindful that the GB ends on August 2. Good luck to everyone who has entered and we look forward to many more entries.